Rosie and Colm just beamed happiness the whole day. It made my job easy! TJ getting all dressed up with his bowtie. The reaction to the wedding car Rosie’s mum had organised as a surprise. Personalised hurleys for the gaurd of honour. The hand painted Christmas bauble wedding favours. I’d never seen something like this before, what a great idea. I bet these will still be hanging on trees around Clare for years to come. Managing to come across two books in the library of the Old Ground that summed up the couple. David’s speech which started out about a young man from Clare who wanted to play hurling in London and got funnier and funnier as it went on. 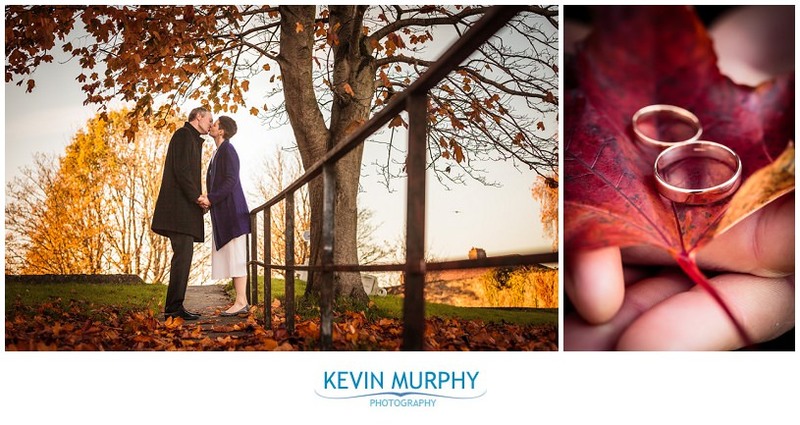 Deirdre & John had a civil service in St Camillus’ registry office, but beforehand I joined them in King John’s Castle to take some natural photographs of them with their families. It was really lovely – so natural, relaxed, personal and intimate. I loved it! And we got a great sunset after the ceremony – bonus! King John’s castle has had a major revamp since the last time I photographed a wedding there. It’s really nicely done and worth a visit. How relaxed and easy going everybody was. There was no stress, rushing around or worrying – it was great. Deirdre and John’s children Riogain and Naoise were absolute stars – so well behaved and happy. We had almost exclusive use of the castle which kept the kids entertained and afterwards we had time to get a nice cup of coffee to warm up. The Autumn leaves were just about still hanging on the trees which made for a great backdrop. Even the official family photograph had their stamp on it, when Riogain refused a motherly kiss and ended up forced to the ground in a fit of giggles! 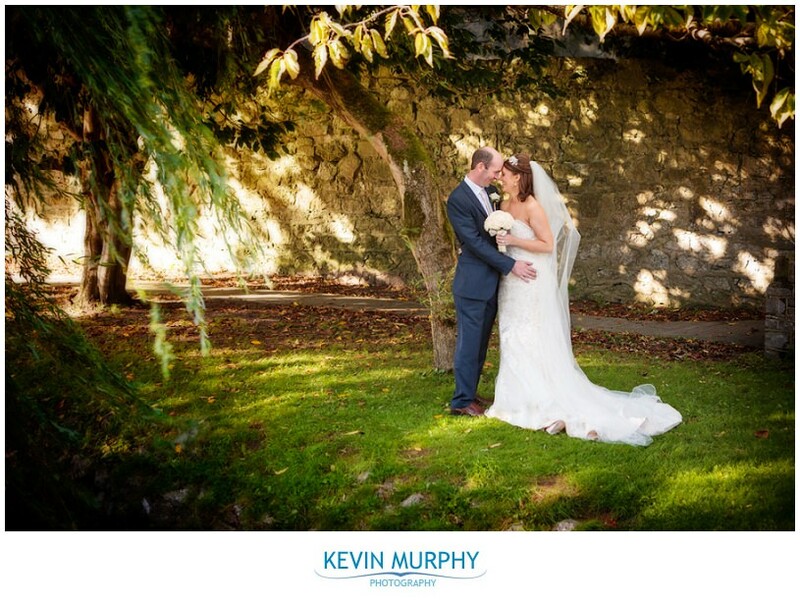 Emma and Declan were married in Ardagh Church in Co. Limerick and had their reception in the Woodlands Hotel in Adare. They are living in Australia but unfortunately they didn’t bring the weather home with them! It was the wettest wedding I’ve photographed so far but everyone was in high spirits and we made the most of it. In the end, I used a little sheltered area so that Emma and Declan were kept dry while I got some photographs of them just as darkness fell. We got a lovely deep blue dusk sky as a background to camouflage the weather! Emma was a bridesmaid at Noreen and Patrick’s wedding so it was great to meet up with familiar faces again. Emma handing over the key to the house to her Dad as she left. How positive Emma and Declan were despite the weather. They made the most of their day – even though they were “trapped” in a pub they never stopped smiling. The ducks on the wedding cake. Genius! The Siege of Ennis – I think there were some dizzy heads after it! 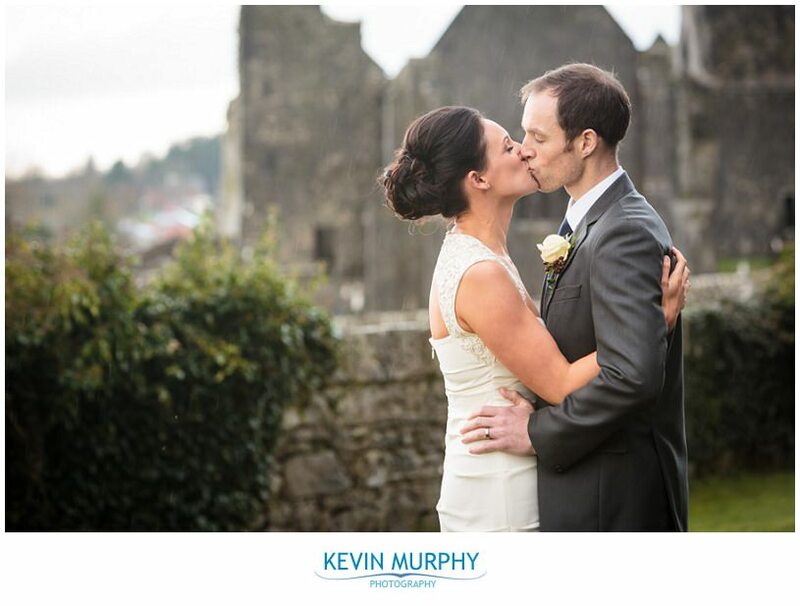 Bridget and David were married in Ardagh Church in Co. Limerick and had their reception in the Brehon Hotel in Killarney. I’m often asked for advice by couples on the lead up to their wedding and one thing I always say is that there’s a good chance that not everything will go exactly to plan, but to just roll with it and enjoy the day. All kinds of things can happen on a wedding day. The weather can suddenly turn nasty in the middle of taking photographs of the bridal party. The wedding car could get a punctured tire. A groomsman could end up in hospital (so you need to find a friend who is the same size to fit the suit!). Traffic could be totally gridlocked on the way to the hotel so everyone is sitting in traffic for 20 minutes. The wedding dress could prove more difficult to tie up than imagined. Unfortunately, ALL of these things happened on Bridget and David’s wedding day! Crazy! But I was so impressed with how they rolled with it, laughed at it and continued to enjoy their day with a smile on their faces. They are an amazing couple. The friendliness at Bridget’s house that morning. I’ve often been offered a cup of tea when I arrive at the brides house, but it was my first time being offered a full Irish breakfast! The craic and stories while Catherine helped Bridget get ready. Hilarious! When Bridget walked out into the kitchen and her family saw her dressed for the first time. It was emotional. The flower girls. I think they had more fun than anyone that day! One flower girl diva taking over the singing duties from the band. Noreen and Patrick were married in Newcastle West Church and had their reception in the Radisson Blu Hotel in Limerick. I went to secondary school with Noreen so it was great to be there to tell the story of her wedding day. How personal it was. I love when couples put their stamp on their wedding day and Noreen and Patrick really made it personal and unique to them. Noreen’s handmade bouquets and boutonnieres. Not only were they hand made, but they were hand made by Noreen herself! Patrick is allergic to flowers so having them made out of paper was not only beautiful but functional too. The little note Noreen had one of her flower girls deliver to Patrick as he waited for her at the top of the aisle. I don’t know what it said, but it put a smile on his face! Converse and Superman socks – boosh! The photo of her dad Noreen had on her bouquet. Noreen and Patricks matching sense of humour. The details at the hotel – lovely notes of wisdom for the guests to finish, photo props, speech betting rules, fun packs to keep the kids entertained – they thought of everything. 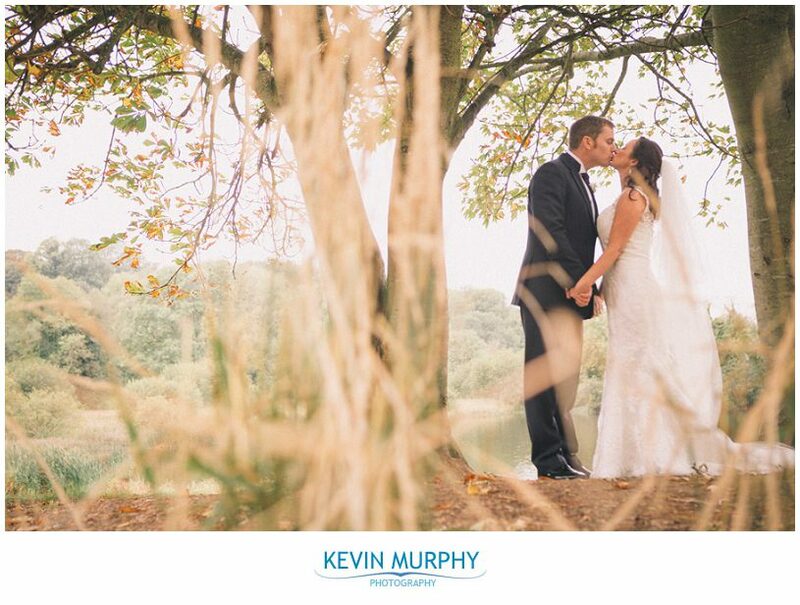 Maria & Kenneth were married in Patrickswell Church and had their reception in the Woodlands Hotel in Adare. 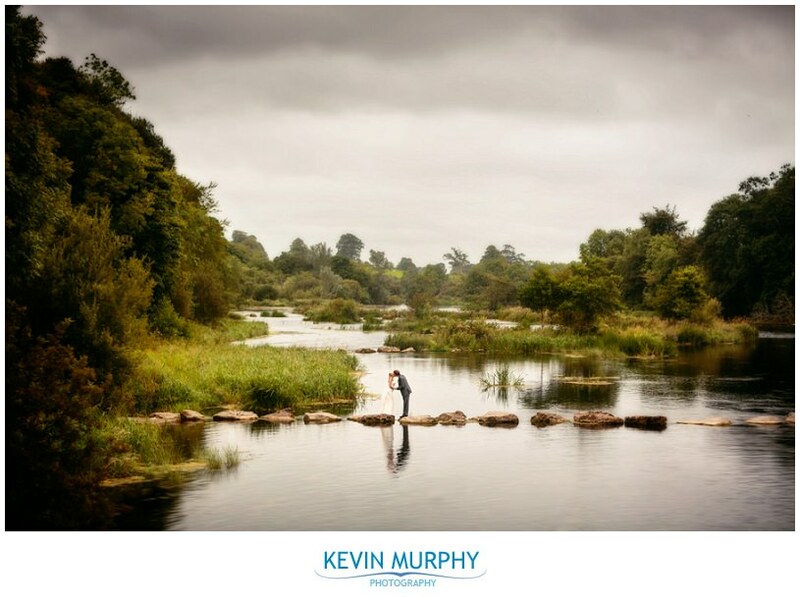 Being so close to Lough Gur we went there to have some fun and take some photographs of the bridal party. How friendly and relaxed it was in Maria’s house that morning – I must have been offered a cup of tea by everyone there at one stage or another! Lough Gur. It was my first time going there with a bridal party. I had scouted it the week before the wedding and I only ended up using a tiny fraction of it, I’m looking forward to getting back there again. Kenneth is a photographer himself, so I brought along an old antique camera that we had some fun with and created some unique, personal photographs. A top tip: One of the page boys handed out directions to the reception after the ceremony, what a great idea. Kenneth’s dad had a bag full of fresh oysters that he was distributing from the boot of his car. They were going down a treat! The decorated tractor. Who knew adding some ribbon could make it look so good! 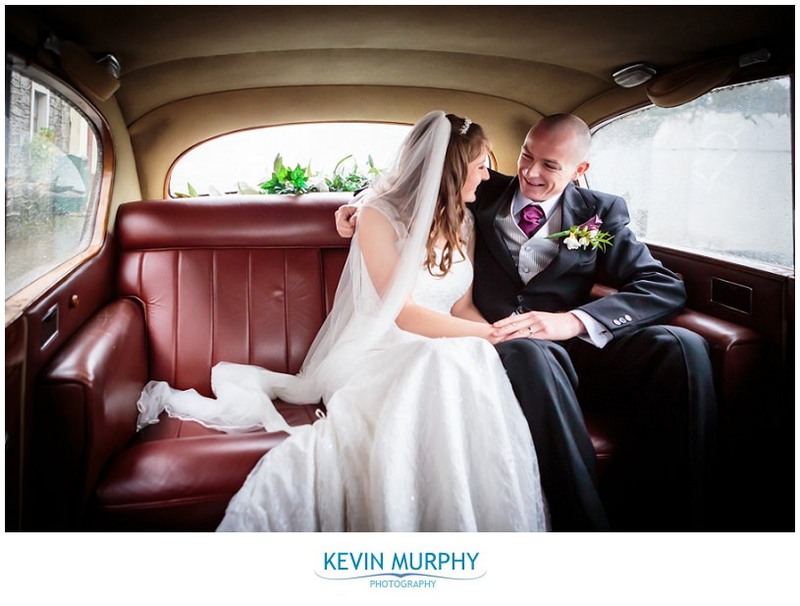 Triona & Liam were married in Ballyagran Church and had their reception in the Devon Inn Hotel. The craic! Liam and Triona have a great sense of humour and after spending the day with them it’s obvious that their friends do too – passing a comb to Liam during a lull in the ceremony had everyone in the front rows in stitches! The beautiful garden and mature trees at Triona’s house. Even though it is a challenge for photography, having a cloudless blue sky is always a bonus – especially in October! Finding some beautiful light by the river in Newcastle West to photograph Triona and Liam in. There’s something magic about crisp Autumn light. How real and natural the wedding was, there were no airs or graces, everybody was there to have a good time and enjoy themselves. 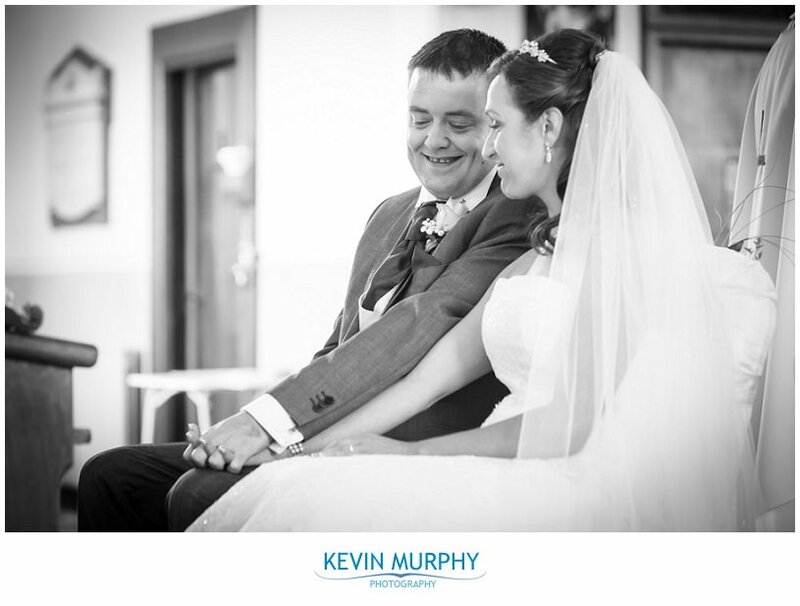 Teresa & Ger were married in Cratloe Church and had their reception in the Bunratty Manor Hotel. It was one of the most relaxed, laid back, chilled out weddings I’ve photographed. Everybody and everything was so natural and real and unassuming. It was lovely. Teresa and Ger were adamant on doing everything their way and not necessarily doing something because it’s the way it’s always done. It made their day unique and personal. They even had their speeches in the church! The members of the walking club (where Teresa and Ger met) put their stamp on the day with their walking poles arch exit from the church and their friendliness. Ger’s “wow” reaction to seeing Teresa walking up the aisle. Fr. Wall’s sermon was fantastic. I always love when the celebrant is a friend of the couple getting married. It was so personal and meaningful (and funny!). 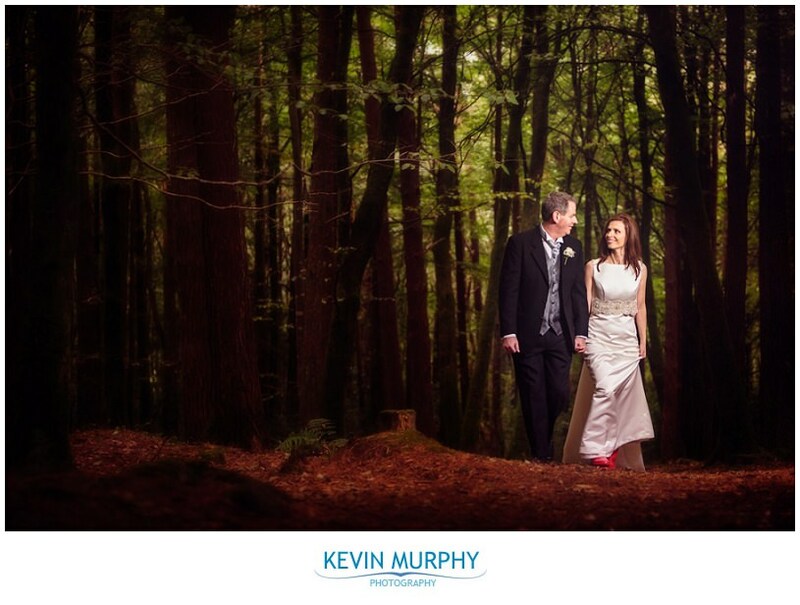 With Teresa and Ger being outdoors people we went to Cratloe woods to take some photographs after the ceremony. We met a lot of other walkers in the woods, some of them even posed for photographs! Co. Clare was in the grip of All Ireland fever (with the first drawn final with Cork being played that weekend) so a guest smuggled a Clare jersey into the wedding car for us to have some fun with! 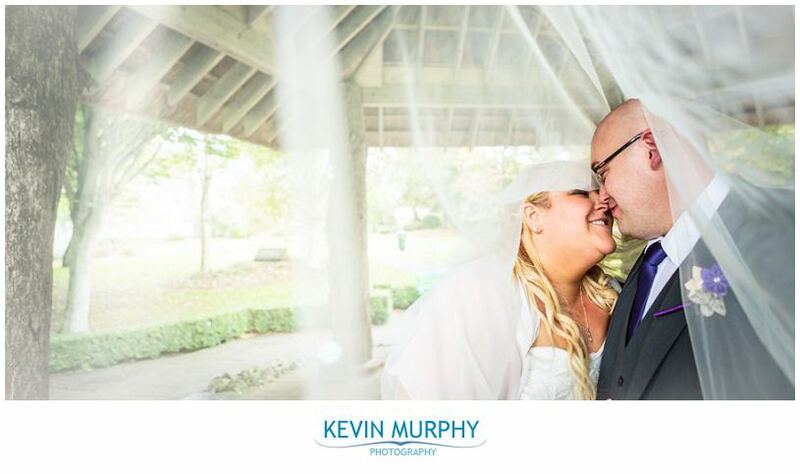 Sinead & Barry were married in Ballyagran Church and had their reception in the Castle Oaks Hotel in Castleconnell. I’ve already shared their same day slideshow with you, but now that I’ve processed all of their photographs I thought I would share a little sneak peek too! The craic. From the start of the day until the very end the entire bridal party were enjoying themselves. It was a lot of fun! The location – it was my first time photographing a wedding at the Castle Oaks Hotel so I had visited it to get some ideas together. Thankfully the weather stayed dry (just about!) and we got the shots I had in mind. The river flowing by the trees is beautiful, I’m looking forward to getting back there again. Their polaroid guest book idea worked out a treat, the bridesmaids were working that polaroid camera like pros! The dancefloor antics were at a new level! Be sure to scroll to the bottom of this post – from dancing grannies, to tango, to “the fish move”, to “the bowling ball” – I stayed longer than usual I was enjoying it so much!